I got a bit of a surprise when my friend Tila Braddock came to pick me up from the Hotel Hesperia Lanzarote, where I’d been staying for a few days, to take me up to the Finca de Arrieta, the eco retreat he and his wife Michele created five years ago in the north of the island. They’ve been using hybrid cars for a while – and include them in the rental for some of the larger accommodation at the finca – but Tila turned up in his new purely electric Renault Twizy, which he’d just picked up that day. I’d like to say I slid gracefully into the back seat, but it was more of an ungainly clamber – although I did get the knack after a few more attempts – and we set off to Puerto Calero, the swish marina down the road, for a spot of lunch at Pez & Pasta. We didn’t actually drive into the restaurant – but almost – just up to the door, and the waiters came out and had a good laugh. Of course Tila knew them all, as well as the owner, Bernardo. Tila and Michelle have been living on Lanzarote for 20 years and know everybody. Everybody. Tila opened a compartment on the front of the Twizy, uncoiled a flex, plugged it into a socket just inside the restaurant. We sat down on the terrace and ordered a bottle of the local Yaiza white wine and some pretty fab tuna while the car charged up. Tila’s plan is to persuade garages all over the island to install superchargers that will recharge the battery much more quickly than normal sockets. The Twizy can apparently do 100 km on one charge, and can get up to 80 km an hour. We put this to test on the way up to Arrieta, driving across the volcanic vineyards of La Geria and chugging uphill to one of the island’s most spectacular viewpoints, where fortunately there was a bar. We had another glass of wine while giving the battery a little boost to get us along the last stretch. Of course, Tila knew the owner, so there was no problem about plugging into their power supply – and it only costs about 25 cents anyway. Tila is thinking of investing in more electric cars to rent to their guests and other visitors to the island. It makes sense. The finca runs on solar and wind power, and the Braddocks are true pioneers of sustainable energy and ecological practice in Lanzarote. This is very much in the spirit of Cesar Manrique, the visionary artist and architect who created extraodinary structures and artworks all over the island, and successfully fought to keep development low key and the landscape unspoiled. It’s a really fun way to explore the island, costs next to nothing to run and doesn’t harm the environment. There was an article in the i paper the other day about how Oxford is now the ‘electric vehicle capital of Europe’ after installing more than 60 new charging points. London has 654, the most in Europe. With 29 new models of hybrid or electric cars being launched in the next 18 months, I think Tila is really onto something – and meanwhile is providing a great source of amusement wherever he goes. 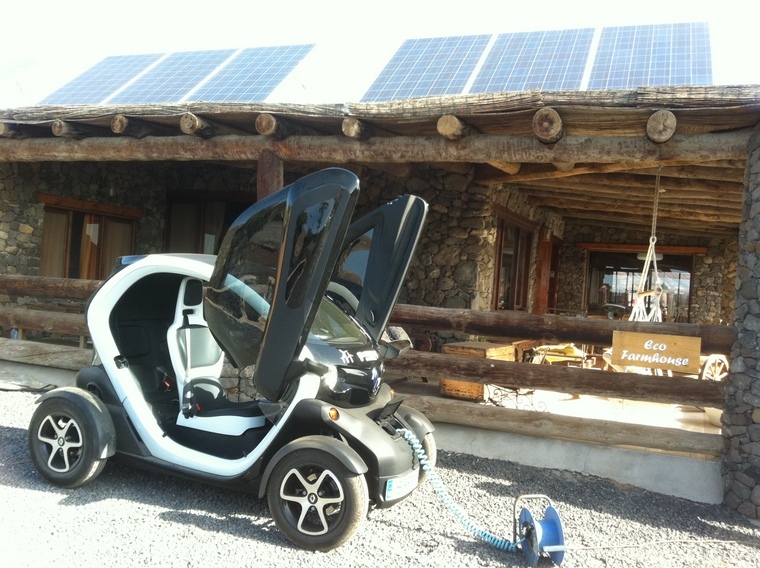 Back at the finca, the Twizy was plugged into a socket in the farmhouse, which of course runs on solar power. It’s not called an eco retreat for nothing. I find this facinating and would love to test drive one. I don’t see too many in Barcelona. Would like to see more of them. The Twizy would be great for zipping around Barcelona and Madrid – although there are no windows in the two models available at the moment. We’ll have to keep on the look out for them! Hi Annie, I would kill for such a car… It must be great the feeling you have driving it. I can just see you whizzing around in a Twizy Dani! 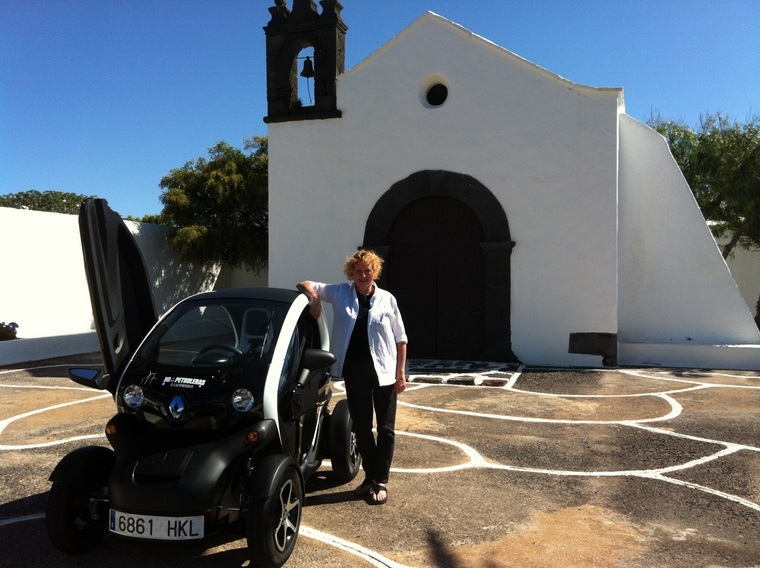 Any guests coming to stay at eco retreat Finca De Arrieta are invited to borrow the Twizy for a day during your stay! Giving you the ultimate eco holiday experience.